The A Game – Where Is My Teaspoon? Hello everyone! The plan today is to go to London and eat an icecream cone in Hyde Park -one of my all time flavourite things to do so pray it won’t rain on me. Flavourite is my new word for any fun experience involving food here on Where Is My Teaspoon because that is just the type of person I am. 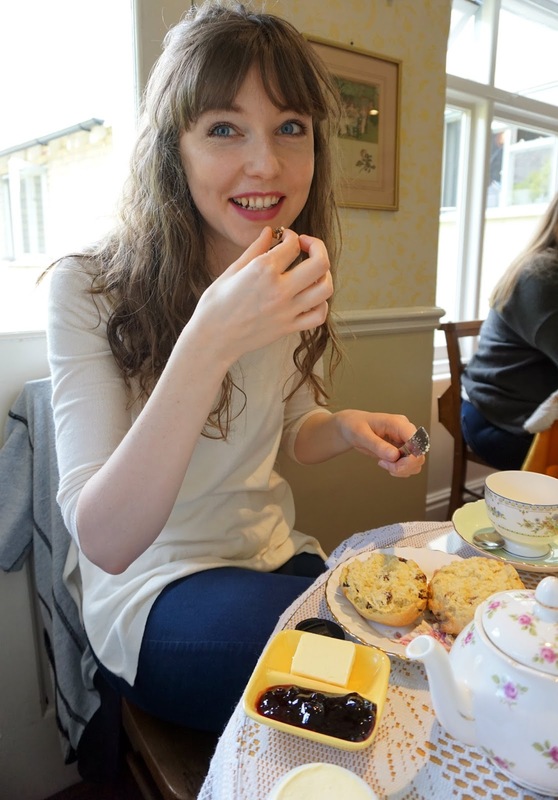 Today I thought it would be fun to talk about happiness – I mean just look how happy I am tucking into that scone? Seriously though, this quest for happiness is a never ending thing and I think when you’re young, it’s something that fills up a lot of your thoughts, especially when you’re trying to build up your career or find something you’re passionate about. It’s so easy to get caught up on social media and following glamorous people and confuse a great Instagram post with real life. It’s also very easy to allow jealousy into your life and into your friendship groups as things just work out quicker for some people than others. It’s really important to just move away from those types of negative thoughts and comparisons and focus on what you want to do. While everyone wants to come out of university blazing and earn a million Euro, the chances of it happening over night are pretty slim. Though if you know of a way to earn a million in a year, hit me up! This teaspoon loves herself a holiday. Seriously though, the thing to remember is a job where you can learn, take pride in your work and enjoy yourself will most likely get you to where you want to go a lot quicker than some horrible job you don’t even care about. I work with a guy now who mentions strategic moves a lot and it’s something I have really started to think about as a result. If you have a rough idea of where you want to go then only you can get you there. It’s great to lean on others and have brilliant mentors and connections but only you can really make it happen and make yourself happy. If you are sitting reading this and are unhappy due to your job, your house, your social life etc, then make a strategic move towards changing it today. Dreams come in a night but to build them takes time. Are you in your early 20s and struggling with what to do with your career? You’ll figure it out. Take time to enjoy things you love this weekend, whether that be a scone with blackberry jam in your favourite tearoom (above) or like bungee jumping. Whatever. 🙂 Everything is going to work out! Time for an ice-cream cone I think 😉 Be sure to follow on Instagram for a peaks at my day out! Previous Post Treacle Scones Recipe.